In this posting I combine a Mini Scoop with some Old News, say to compensate the poorness of the one with the age of the other. The unofficial news is that Château Charmail is sold. As soon as I know more I will come back to this. Provided it is interesting. Charmail's (old?) owner is Olivier Sèze. He bought the château in 1980 when it was in a very bad condition. And ever since it has been his life's work to have Charmail's star shine again, as it had done a long long time ago. Anyway, a change of ownership is not the first thing that comes up when thinking about Château Charmail. But then again, maybe it is just a rumour. A year ago, to be precise on 9 February 2007, I tasted the Charmail 2004. And if you're interested, this was my impression: "Dark and concentrated looks. Unless some sweetness in the nose this wine (still) shows some hard edges, seems somewhat locked up. Palate with much concentration, firm acids and grainy tannins. Young, and difficult at this moment." Clearly a wine to taste again. It is illustrated by the Italian artist Giuseppe Penone. Quote from Mouton's website: "In his art, Penone seeks to link the vegetal world and the human body in works that display their powerful materiality. 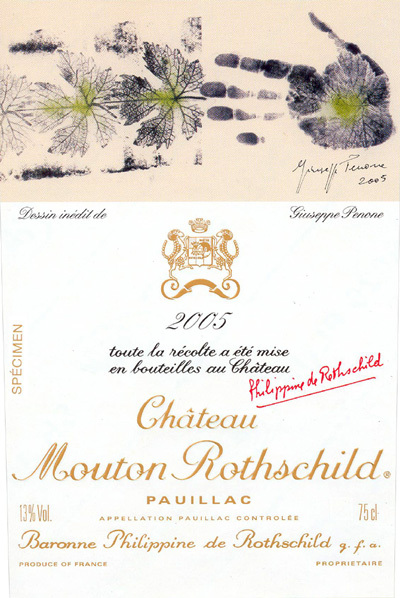 His drawing for Mouton 2005 evokes the vine-grower's "green fingers", a living expansion of the vine leaf and at the same time the splayed hand of the drinker – soon to close round a glass of Mouton!" At least when you're lucky, regarding this last thing. I did have the luck already to taste the 2005, in April 2007, at the château. I remember it was grand, but I was so stupid not to take a note... 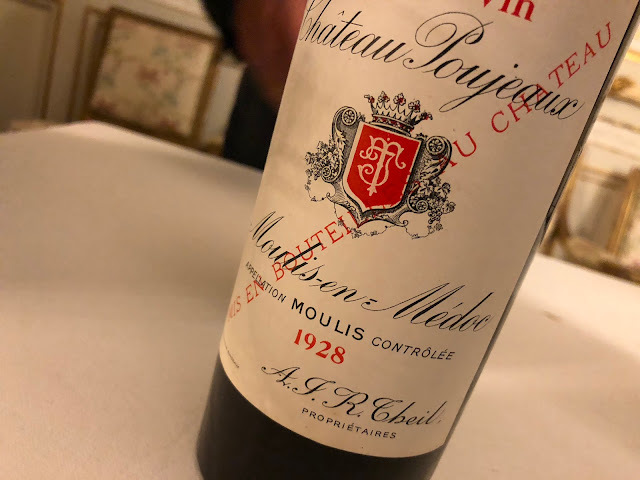 So I hopefully get another chance to "close my hand around a glass of Mouton 2005."